Bollywood Comes to Bellingham Directly from Maher in India! Please join us for a talk on Friday evening, September 27th, and a Bollywood dance class on Saturday the 28th in the afternoon, followed by a dance to celebrate the love and brilliance of the Maher model of healing that works through the assistance of many loving hearts, helping hands, and a spiritual backbone of depth and breadth, within a deeply inclusive community. The dancing is for all ages, and is in the spirit of celebration and fun, so please join in! Everyday is a CELEBRATION at Maher! We remember this with poignant reflection as we hold the fullness of our time here, nearing our departure. Once during our days at Maher, Sister Lucy went to Mumbai to meet with the Governor of Maharashtra, the state in which Maher is located, to invite him to Maher’s 16th anniversary celebration in February. She also made some practical requests regarding licensing, and in true form, found a way to advocate for women and children as well. 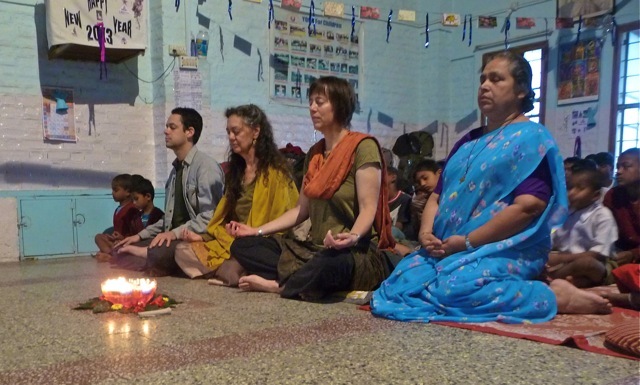 Each morning the community gathers for prayers, and in addition to the daily ritual, special prayers are offered for trips such as this, for a competition a student may be attending, for birthdays and goodbyes and for WELCOMING. We were continually welcomed by the children and staff of Maher; this community is a living example of what Sobonfu Some describes in her Dagara rituals involving healing and preparation of the mind, body, spirit and soul to receive the spirituality that is all around us. “It is always challenging to bring the spiritual into the material world, but it is one of the only ways we can put people back in touch with the earth and their inner values.” We lived this moment-by-moment in the daily heartbeat of Maher. And now, on the brink of departure from South Goa, and India, celebrating Brel’s 28th birthday at Ordo Sounsar, which translates to “another world,” we continue in this tradition of heart and spirit infused living. In the morning, the young men working here hang red balloons surreptitiously on our beach hut porch before Brel awakens. The guests wish him happy birthday. We take a boat out with Captain LUCKY to catch crab for a birthday feast that we will share with whomever is in our midst…and of course, Lucky himself…no invitations, no formality, just welcoming the moment and welling up with gratitude for the grace of our journey. We arise in the morning and walk to the north end of the beach where the river meets the sea to offer prayers, awaiting our return to the Nooksack, the river of change that daily reminds us of this one and only constant. We will soon reunite with you, our home community, and look forward to welcoming each of you with the same expansive love we received time and again at Maher. We will carry in our hearts, bodies and souls the living example of daily celebration and generosity that nourished us so fully in south India. Many of you left donations in the piggy bank which I brought to class, and I am delighted to say that we will be bringing all of the proceeds to Maher in just a short time. I have included this photograph of the Maher banner that speaks to its spiritual and religious diversity and inclusion; I am not certain you will be able to see the fine details, but please visit the Maher Ashram site for more details about the place, and before long I will offer stories of my direct experience. In the meanwhile, I am deeply grateful for your presence in my yoga community, your participation in my classes, and your generosity and kindness. I hope to see you in the Winter classes, and that you will be among the fortunate who will study with Maria Bacher as the new session begins! This is to convey you the happy news that Sr Lucy is back with us with her inimitable hearty laugh with her heart full of love for every one of us. How much every child, woman and worker here at Maher missed her the two months she was away from them ! They could hardly wait to see her back among them to keep them going in life enthusiastically with their ever cherished dreams for Maher. With Sr Lucy around, for everyone at Maher, every new day opens with new dreams, aspirations, plans, and tons of energy to achieve them. Maher workers gave a very warm welcome to Sr Lucy at the Mumbai airport as also at Pune the following morning. They represented every Maher center expressing their sentiments through greeting cards, placards, flowers and garlands. With a grand breakfast and Sr Lucy around after a long gap, the morning became a great home coming for all of them. I along with whole of Maher family thank each and every one of you for making her feel so much loved and cared for. We feel she deserves the best in the world and the best for her is Maher and its people. Sr Lucy had so much to share with us about Maher’s special friends she met abroad. She had carried back with her a tiny gift for each and every one of us. This gesture was appreciated by all the staff, women and children at every center. One of these days, Sr Lucy would definitely like to interact with you on her travel abroad. Elizabeth’s work with Friends of Maher in Bellingham Herald! See the rest of this Bellingham Herald article out just moments ago on the Bellingham Herald website, here. Above, see a picture of Elizabeth along with Jillian Froebe, Paula Brown, Shirley Osterhaus and Krista Hunter – as they celebrate with Maher’s founder and head, Sister Lucy Kurien during a recent visit.